HF-L Middle School to present Aladdin, Jr.
Home HF-L Middle School to present Aladdin, Jr.
It’s a whole new world for over 60 sixth-, seventh- and eighth-grade students at Honeoye Falls-Lima Middle School as they take to the HF-L District Auditorium stage, some of them for the first time, this weekend when the school presents Disney’s Aladdin, Jr. The musical is 60 minutes long and is based on both the 1992 Disney film and the 2014 Broadway adaptation. It presents the legendary tale of Aladdin, the lovable thief with a heart of gold. He and Jasmine and the wisecracking Genie will take the audience along on their discovery of mystical caves while also taking magic carpet rides and outwitting evil sorcerer Jafar. The musical, adapted for middle school-age performers, still includes favorite Alan Menken songs from the film such as Friend Like Me, A Whole New World and Prince Ali along with some new songs from the Broadway show. In addition to the students onstage, many Middle School students will have key roles backstage such as in lighting, sound and stage crew. 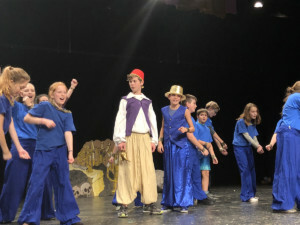 Students on stage are David Tuller (Aladdin), Molly Kraynik (Jasmine), Nick Boggio (Genie), Jason Howard (Babkak), Zach Schayes (Omar), Maegan Frame (Kassim), Noah Adams (Jafar), Braeden Weaver (Iago), Colin Fanning (Sultan), Lily Quackenbush (Isir), Ella Clark (Manal), Myah Seniuk (Rajah), John Boyce (Razoul), Jackson Carmichael (Prince Abdullah), Olivia Gangi (Shop Owner), Grace Casler (Apple Vendor/Arabian Nights soloist), Caiden Benson (Fortune Teller), Abby Fraser (Beggar 1), Clara Bradley (Beggar 2), Makayla Klein (Beggar 3), Matilda Lyle (Attendant to Prince Abdullah), Mary Repass (Attendant to Prince Abdullah), Eli Webster (Guard 1/Cave of Wonders/Spooky Voice), Zack Boehm (Guard 2), Annabelle Lyle (Ensemble, soloist), Amelia Somers (Ensemble, soloist), Danielle Young (Ensemble), Owen Boggio (Ensemble), Jorja Harvey (Ensemble), Ellie Camp (Ensemble), Jenna Quinn (Ensemble), Kaelyn Frame (Ensemble), Macy Letendre (Ensemble), Carter Reed (Ensemble), Porter Scully (Ensemble), Mackenna Weaver (Ensemble), Kaylee Henshaw (Ensemble), Madison Fleming (Ensemble), Logan Feszczyszyn (Ensemble), Maggie Grann (Ensemble), Delany Buckley (Ensemble), Sophie Torres (Ensemble), Paige Moscicki (Ensemble) and Sophia Jacopille-Bornheimer (Ensemble). Working on the offstage crews are Kim Salter (student manager makeup crew), Abrey Cates, Alia Spaker and Ivy Yates (all makeup crew), Carter Parker (light crew manager), Harrison Houle, Lachlan Youngblut and Walker Scott (all lighting crew), Jonas Koch (sound crew manager), CJ Harrison, Keren King, Olivia Jacobs, Caroline Smith (all sound crew), Bernadette Whelen (student backstage manager), Erinn Attkinson, Sophia Burke, Jonas Coleman, Maddie Hobaica, Gina Piccirilli, Sam Robson, Conlan Rorick, Jack Wirth, Nick Bastian (all stage crew), Maren Gregg (props), Ivy Yates (student photo crew manager), Walker Scott and Hanna Stroup (both photo crew), Lula Camp (student costume crew manager), Aubrey Bent (costume manager assistant), Emma Benson and Katelynn Guckian (both costume crew), Emily Ford, Evie Ha, Hannah Miller, Caedan Quinn, Indianna Thompson and Katelynn Vukosic (all publicity crew) and Olivia Gangi (student dance assistant). The show is Friday, November 16 at 7 p.m. and Saturday, November 17 at 1 p.m. and 7 p.m. Tickets are $5 for the matinee performance and $8 for the evening performance. In addition, the students are hosting a food drive to benefit Foodlink and will have collection boxes for non-perishable food item donations at each performance.